The theatre comes to a hush as the red velvet curtain rises, revealing three women in long skirts and three muscular men. As the pianist sends sound waves of twinkling piano notes throughout the audience, the three couples melt into the music and glide across the stage in swift, gravity-defying movements. If you’re drawn into this scene, and want to know more about what these dancers can do, join American Repertory Ballet (ARB) at State Theatre New Jersey this October with Carmen and Other Works. ARB graces our stage with a triple bill: The Eyes That Gently Touch, a poetic contemporary ballet piece; Straight Up With A Twist, a sensual and playful contemporary ballet piece; and Carmen, the fierce and Spanish-inspired classical ballet story. The next piece takes a whole different spin on these romantic ideals. 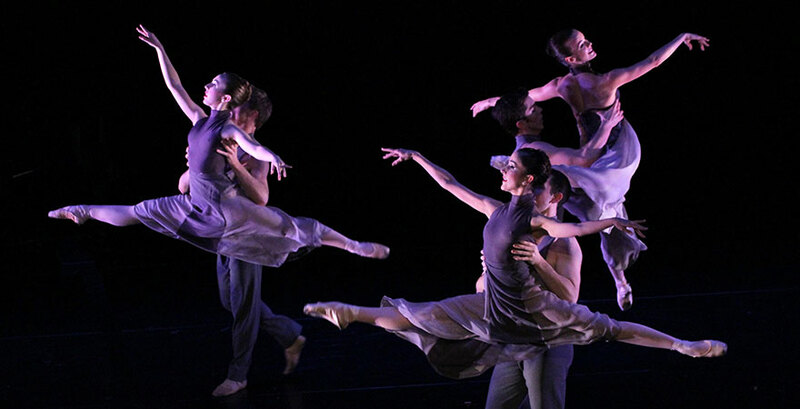 Straight Up With A Twist, a piece created specifically for American Repertory Ballet, has been a staple in the company’s repertoire since its creation. The piece was choreographed by famous ballerina with the Joffrey Ballet in Chicago and the Washington Ballet: Mary Barton. Barton took the music of violinist Kaila Flexer and created jazz-inspired balletic movements to depict a mood of playfulness and sensuality. From the very first powerful image of 10 posed dancers’ silhouettes on stage, the piece has non-stop high energy and is highly physical with intricate patterns, strong partnering work, and perfectly-in-unison group sections. The final piece of the triple bill tells the tale of young love, wild hearts, and a love triangle. Carmen, choreographed by Peterson (choreographer of the first piece), is a classical ballet based on the original opera by Georges Bizet. Carmen is a passionate and free-spirited young girl living in Seville, Spain in the early 1800s. She is in love with Don José, however the popular bullfighter Escamillo is in love with Carmen. Set with Spanish-inspired ballet movements, the story escalates with battles, marriages, and even deaths; all in the name of true love. American Repertory Ballet’s Carmen and Other Works expresses the many spectrums of love and romance through three very different ballet-inspired pieces. The night shows off the many different talents and versatility of American Repertory’s dancers and choreographers. Definitely a night of dance you won’t want to miss, come check out American Ballet Theatre’s Carmen and Other Workson October 12 at 7:30pm at State Theatre New Jersey.